After suffering the enormous tragedy of massive natural disasters, a category 9 earthquake and 4-metre tsunami, Japan is now wrestling with the awful problems of a major nuclear incident. 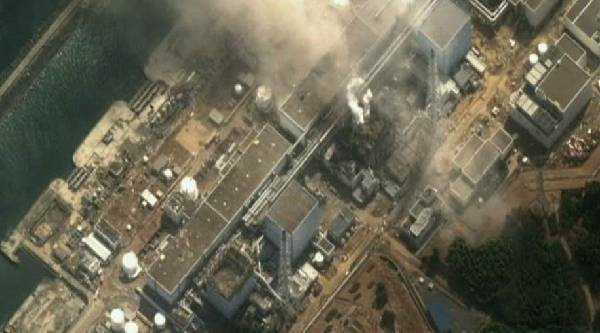 The power plant at Fukushima has ongoing problems with four of its reactors. There has been Hydrogen explosions at three and a fire at the fourth. There are many differences although there are some similarities between this emergency and the one at Chernobyl in 1986. The reactor rods are encased in a Zirconium alloy that is highly durable but unfortunately does displace Hydrogen from steam at high enough temperatures. The explosions at three of the reactors are said to have been caused by Hydrogen gas igniting. The fourth reactor is used for the cooling of spent fuel until it can be safely removed for long-term storage. A fire seems to have started at this reactor due to spent fuel rods becoming exposed. The following is a summary of the main facts. The earthquake that hit Japan was several times more powerful than the worst earthquake the nuclear power plant was built for (the Richter scale works logarithmically; for example the difference between an 8.2 and the 8.9 that happened is 5 times, not 0.7). When the earthquake hit, the nuclear reactors all automatically shutdown. Within seconds after the earthquake started, the control rods had been inserted into the core and the nuclear chain reaction stopped. At this point, the cooling system has to carry away the residual heat, about 7% of the full power heat load under normal operating conditions. The earthquake destroyed the external power supply of the nuclear reactor. The reactor and its backup systems are designed to handle this type of accident by including backup power systems to keep the coolant pumps working. Furthermore, since the power plant had been shut down, it cannot produce any electricity by itself. For the first hour, the first set of multiple emergency diesel power generators started and provided the electricity that was needed. However, when the tsunami arrived it flooded the diesel generators, causing them to fail. The incident was originally given a category rating of 4. (The International Nuclear and Radiological Event Scale — or INES — goes from Level 1, which indicates very little danger to the general population, to Level 7, a “major accident” in which there’s been a large release of radioactive material and there will be widespread health and environmental effects). However the explosion on Tuesday has elevated the situation in Fukushima to a “serious accident” on a level just below Chernobyl, according to a French nuclear official. “It’s clear we are at Level 6, that’s to say we’re at a level in between what happened at Three Mile Island and Chernobyl,” Andre-Claude Lacoste, president of France’s nuclear safety authority, told reporters. The Japanese Government had already ordered a general evacuation of the population within a 12-mile radius and within a further 18-mile radius people are being advised to remain indoors. For now, the biggest concern at the No. 3 reactor is the uranium-plutonium fuel, called MOX (for mixed oxides of uranium and plutonium) that was loaded into the reactor last year, Moglen said. Hence, it is likely that spent fuel rods stored outside the reactor’s containment vessel are uranium-only. Plutonium is weak emitter that registers low on radiation detectors, but it is an intensely radio-toxic material. If inhaled by humans even in microscopic quantities, it would likely cause fatal lung cancer within 18 to 20 years, Moglen estimated. 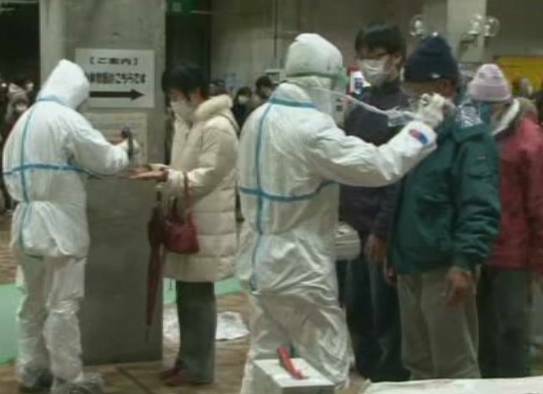 Authorities have confirmed that radioactive iodine, which causes thyroid cancer, and caesium, which causes leukaemia, has been detected in the air around Tokyo, according to Moglen. However, if the No. 3 reactor’s core melts down, plutonium will likely be one of the constituents discharged directly into the air. Nuclear reactors vary greatly in specific design but all have certain basic principles in common. Uranium is exposed to a source of low velocity neutrons which starts the fission process. 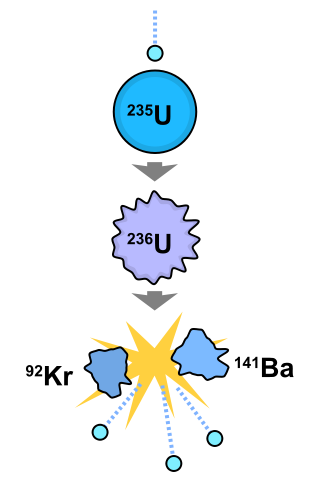 Fission is essentially the splitting in two of the Uranium atomic nucleus which in turn releases more neutrons and unleashes a chain reaction. This process releases an enormous amount of heat as a tiny fraction of the mass is converted to energy. This follows the familiar equation E=mc². Nuclear reactors must have a cooling system to make use of the heat energy. They must also have a means to control the reaction which is usually achieved by neutron absorption. In Chernobyl graphite rods were used as a means to shut the reactor down and one of the problems at Chernobyl was that these ignited. In Fukushima the control rods are made of boron. During normal operation the control rods are used to maintain the chain reaction at a critical state. The control rods are also used to shut the reactor down from 100% power to about 7% power (residual or decay heat). In this illustration the decay products are Krypton which is an inert gas and Barium but in a real reactor the decay products would be variable, especially in a reaction which is no longer under control. In the Chernobyl incident radioactive Iodine was released which lead to increased levels of thyroid cancer. Other hazards include Caesium, which would explode on contact with water, Strontium which can replace calcium in bones and Argon gas which though inert chemically could be inhaled. The residual heat is caused from the radioactive decay of fission products. Radioactive decay is the process by which the fission products stabilize themselves by emitting energy in the form of sub atomic particles and gamma rays. The priority now is to maintain the integrity of the fuel rods by keeping the temperature below 1200°C, as well as keeping the pressure at a manageable level. In order to maintain the pressure of the system at a manageable level, steam (and other gases present in the reactor) have to be released from time to time. This process is important during an accident so the pressure does not exceed what the components can handle, so the reactor pressure vessel and the containment structure are designed with several pressure relief valves. So to protect the integrity of the vessel and containment, the operators started venting steam from time to time to control the pressure. At one point engineers decided to inject sea water (mixed with boric acid – a neutron absorber) to ensure the rods remain covered with water. Although the reactor had been shut down, boric acid is added as a conservative measure to ensure the reactor stays shut down. Boric acid is also capable of trapping some of the remaining iodine in the water so that it cannot escape, however this trapping is not the primary function of the boric acid. Shaun Burnie of Greenpeace expressed concern about the other two reactors on-site and drew attention to the operating flaw of holding spent rods in massive pools that are not encased in a safety material. He said this was normal practice with this type of reactor and there was a total of 1800 tonnes of fissile material at the power station. He said that Greenpeace had warned in the past about possible scenarios involving one reactor which would be bad enough. Although hopefully this will not prove to be as serious an accident as the one at Chernobyl (which spread radioactive material for thousands of miles and left the immediate locality uninhabitable) this is still already catastrophic. When I think of the amount of debris which resulted from the tsunami, radioactive decay products becoming mixed up with this debris could compound the problem considerably. Assuming this remains largely a localized event which is bad enough in itself, both Russia and Germany have already scheduled a review of their nuclear industry. The Scottish Government were challenged on Newsnight Scotland over the possibility of early decommissioning at Hunterston and Torness which met with a negative response but this incident must pose a massive question mark over the wisdom of building any new nuclear power stations world wide. Germany has temporarily shut down seven nuclear power plants that began operating before 1980, and the government has promised to study ways to speed up the adoption of renewable energy in the wake of the catastrophic events in Japan’s Fukushima nuclear power stations. After an emergency meeting of senior energy officials and industry representatives on Tuesday, European Union members have agreed to conduct earthquake “stress tests” of nuclear plants across the EU. Besides seismic activity, threats from tsunamis, terrorism, technical failures and heat waves will be examined. 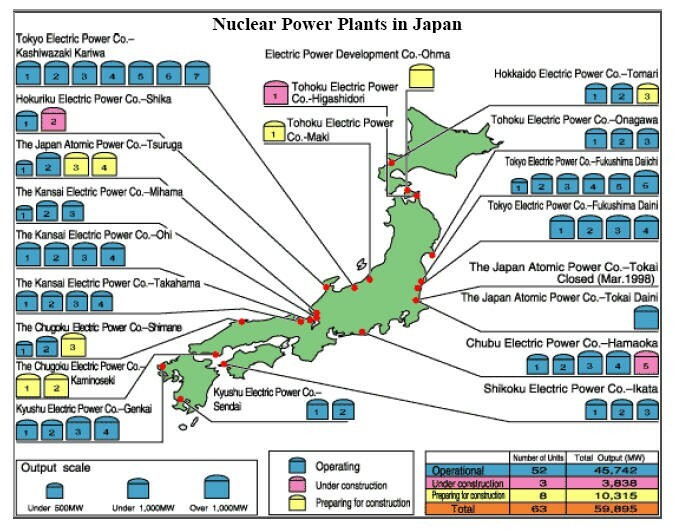 On Monday, EU energy commissioner Günther Oettinger stated about the situation in Japan: “The unthinkable has occurred. Energy policy faces a fundamental new beginning.” The stress tests — which are not compulsory but were not opposed — are expected to be conducted in the second half of 2011. The seven plants to be closed at least through June produce one-third of Germany’s nuclear energy. The plant closures come after German Chancellor Angela Merkel ordered safety checks on the country’s nuclear power stations. This past weekend, tens of thousands protested Germany government plans to extend the life of 17 aging nuclear plants for an additional 12 years. As a result, the German government announced a three-month delay in its decision to keep the 17 nuclear stations open. Nuclear energy provides 25% of Germany’s electricity. event of meltdown. These new designs may be a vast improvement but many of the safety systems at Fukushima seem to have failed when severely tested. This perhaps demonstrates that design features that are meant to prevent catastrophic accidents can only be properly tested in a real world situation when design flaws that might remain would only be discovered after the event. Many reactors are sited close to the coast where they may be vulnerable to some of the worst effects of climate change. If an offshore wind farm was assaulted by extreme weather conditions it would probably be repairable and there would be no nuclear hazard. Even the most advanced nuclear power stations might be contained in a very robust structure but they still require external power to keep the essential cooling systems working. They have almost the destructive power of a small atomic bomb and they are only regulated by the state. They are privately run business which have to balance profit and safety and they still have no reliable safe way to put the spent material into deep geological storage. Added safety costs will push up the costs, the cost of decommissioning can be huge already and the decommissioning of a wrecked plant might be a even more so. Costs of decommissioning Dounray are currently estimated at 4.5 billion pounds. One of the hazards that had to be dealt with there was radioactive sodium which is a forms caustic soda in solution and is a chemical hazard as well as a radioactive one. Nuclear plants are getting safer but they are becoming more expensive and many forms of Renewable power are now competing well financially. There is still no solution to safe long-term storage of spent material which remains dangerously radioactive for thousands of years. So what might be the Alternatives? Around the world you need to think about the possible natural niches for the various forms of renewable Energy. For the Sahara for example you may need to think about photo voltaic cells or other means to trap the strong sunlight during the day and for Japan ironically you may need to think about geothermal energy. A prominent US environmentalist said Japan should focus on developing geothermal energy, saying the volcanic island-nation could become the global leader in the field. “Japan could make geothermal energy the centre of its new energy economy just as the US or China will make wind the centre of theirs,” Lester Brown, president of the US-based Earth Policy Institute, told a news conference. “There are no leaders in the world today in this field. There is no industrial country in the world that now has a well established geothermal industry” Brown said at the Foreign Correspondents Club of Japan. Japan, located at the crossroads of four tectonic plates and on what is known as the “Pacific Ring of Fire” and dotted with volcanoes, is one of the world’s most quake-prone countries. If Japan can launch full development of geothermal energy technology, “it would not only lower carbon emissions in Japan, but it would also give Japanese industry the potential for playing a leading role in developing the world’s geothermal energy resources.” he said. Brown noted that demand for the technology would grow in other geothermal-rich countries located on tectonic fault lines such as Indonesia and the Philippines in Asia as well as Chile, Peru and Colombia in South America. “This is an opportunity for Japan to move to the centre stage in an area where it is richly endowed,” he added. Japan makes use of hot springs as a resource for tourism, but geothermal energy only accounts for 0.3 percent of its energy mix, and the country relies heavily on imports of oil and other resources. Japan, Asia’s biggest economy, has pledged to cut greenhouse emissions by 25 percent by 2020 from 1990 levels, provided other major emitters also make sharp reductions, one of the most ambitious targets of any industrialised country. Japan is the fifth largest emitter of greenhouse gases, which are blamed for raising global temperatures, melting the Earth’s ice caps and glaciers, and changing weather patterns. They need to replace the use of fossil fuels but their nuclear industry must now have a huge question mark around it. Japan should start by replacing the capacity of Fukushima with clean safe geothermal plant and extend this with other suitable renewable means of generation. No More Nuclear Power! Renewable Energy now! From history we learn…I think not!. Talk about burying bad news, I’ve just read this about the Windscale accident in 1957: The reactor tank itself has remained sealed since the accident and still contains about 15 tonnes of uranium fuel – which, due to the presence of pyrophoric uranium hydride formed in the original water dousing, could still reignite if disturbed. “Nobody has touched it for almost 50 years because of a fear that it could either catch fire again or go critical and explode.” The pile is not scheduled for final decommissioning until 2037. Found two maps, can`t put both links on the same post as the post then disappears into the ether!. This man is a mind of information. Can Truly Red stop making multiple postings of this type on the threads? I’m sure he/she is trying to be helpful and that the links provided are all relevant, but I think many people scanning down the thread and seeing post after post by the one individual will be put off posting themselves. Why not just save the relevant links you come across, Truly Red, and post them in a single post, perhaps with a short explanation of how they relate to the topic under discussion. Alan, the BIG problem with all this is, you say something and people come on asking for a link or verification!!!. People don`t take your word for it!.Also putting them all in “single post” sometimes doesn`t work on this site and I don`t come across them all at the same time!. By the way what evidence do you have to the point your making ?, I haven’t seen that!, If you could provide a link I would be most grateful. Truly Red. Multiple link posts do work but anyone who posts more than once in a short time frame may find that their second post is delayed because it’s automatically held in a moderation queue. Everything that could go wrong did go wrong. An 8.9 quake causing a tidal wave that killed 25,000 people takes place under 4 elderly nuclear reactors and the resulting death toll from this nuclear catastrophe is ………zero. So far. It is possible that some people may contract cancer, It is even possible that a handful may die a few years earlier than they would have. Piper Alpha killed 167 worlers. Over a hundred died building the Hoover Dam. 144 died at Aberfan. Nuclear is safe and clean. Nuclear is dangerous and deadly. It is only a matter of sheer contingency, good luck and the personal bravery of plant workers who went into a dangerous situation to try and contain the crisis that has kept the Fukushima incident from becoming a Chernobyl scale disaster as opposed to a Three Mile Island scale disaster. Keeping nuclear fission even relatively safe and dealing with waste products and decommissioning mean huge costs for both old and new nuclear fission plants. At a time when we should have a sense of urgency in developing large scale renewable power – offshore wind, wave and particularly tidal power to meet energy needs its scandalous that we should be diverting funds to nuclear fission. Anyone who reads my articles for this magazine regularly will realise that I’m no lentil eating anti-tech Luddite. I support research into nuclear fusion for instance, because conversion into energy is 100% leaving no waste products – although containment is a major problem. The costs and potential costs of nuclear fission plants is just too great. The tragedies that boogieck mentions were all terrible examples of corporate negligence on basic health and safety – but they do not make a case for nuclear power. In addition to the points made by Steve A and Truly Red, there is the decommissioning problem. My friend Andy Sutherland lived in Thurso and had an inside knowledge of the costs involved in decommissioning the reactor at the Caithness power station. He graphically descibed how the costs and challenges of decommissioning far exceeded expectations. Twenty five years on and the decommissioning of the Chernobyl reactor is still a work in progress. The exclusion zone remains in force. If hopefully the Fukushima crisis is favorably contained, there will be a legacy of an exclusion zone and a decommissioning problem that will endure for decades if not centuries. No comparison can therefore be made with accidents involving fossil fuels and if any attempt whatsoever is made to include such risks in an economic comparison with renewable energy, then renewables win hands down. The comments below the article are worth a read.